Reynolds & Sons, like several other UK manufacturers of the time, modernised the traditional court card designs in around 1840 with an overlay of decorative engraved patterns. 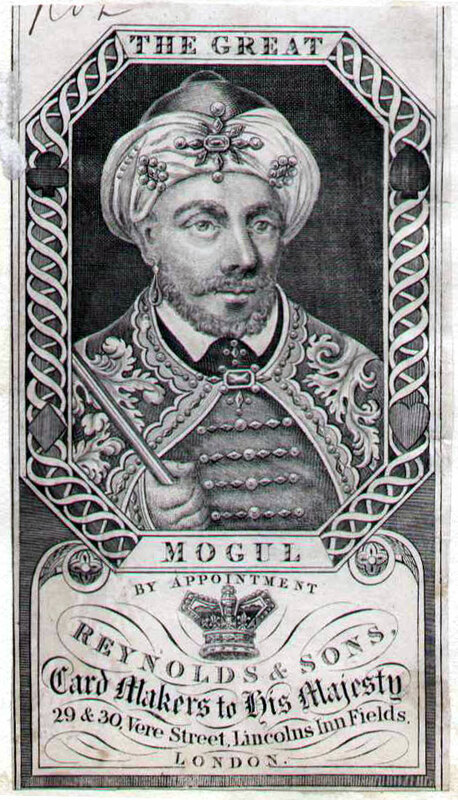 Joseph Reynolds had been producing playing cards in the traditional method since c.1809 (click here to see) but new technologies facilitated a move away from woodblocks and in turn prompted changes in fashion and taste so that manufacturers began experimenting with new, 'modernised' designs (see also: Hunt and Sons, Bancks Brothers, De La Rue, Goodall & Son). The trend was subsequently imitated by foreign manufacturers (e.g. Boisse). Reynolds also produced a double-ended version of their new designs (shown below) as double-ended playing cards were becoming accepted at this time. In the double-ended version, although more convenient, many charming features of the designs are lost. 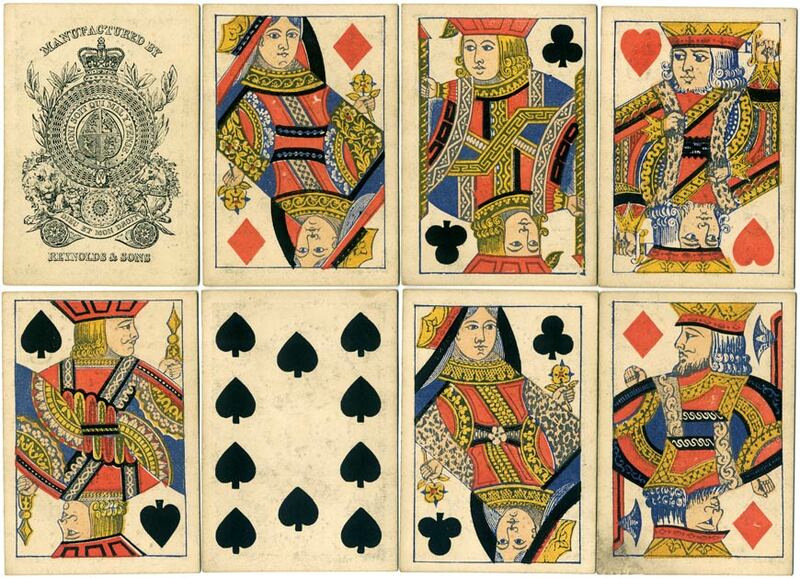 Above: Redrawn versions of the traditional English courts, both full-length (top two rows) and double-ended versions (bottom two rows). In the top version, the old method of colouring with brush and stencils has been used, but this was replaced as technology advanced with letterpress printing. 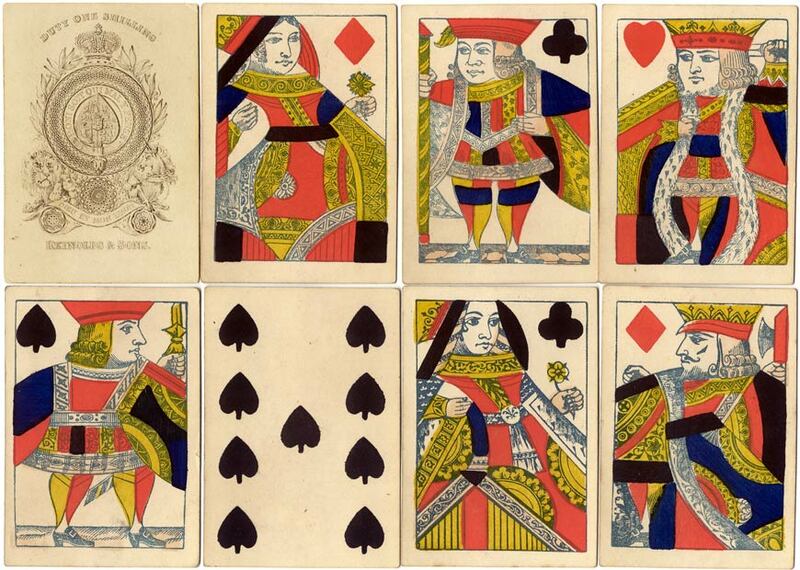 In 1862 the 'Old Frizzle' Ace of Spades was discontinued, and manufacturers designed their own aces which became a sort of badge or manufacturer's identity device. Note that in both the above examples, the numeral cards are always full-length, or one-way with no index numbers. 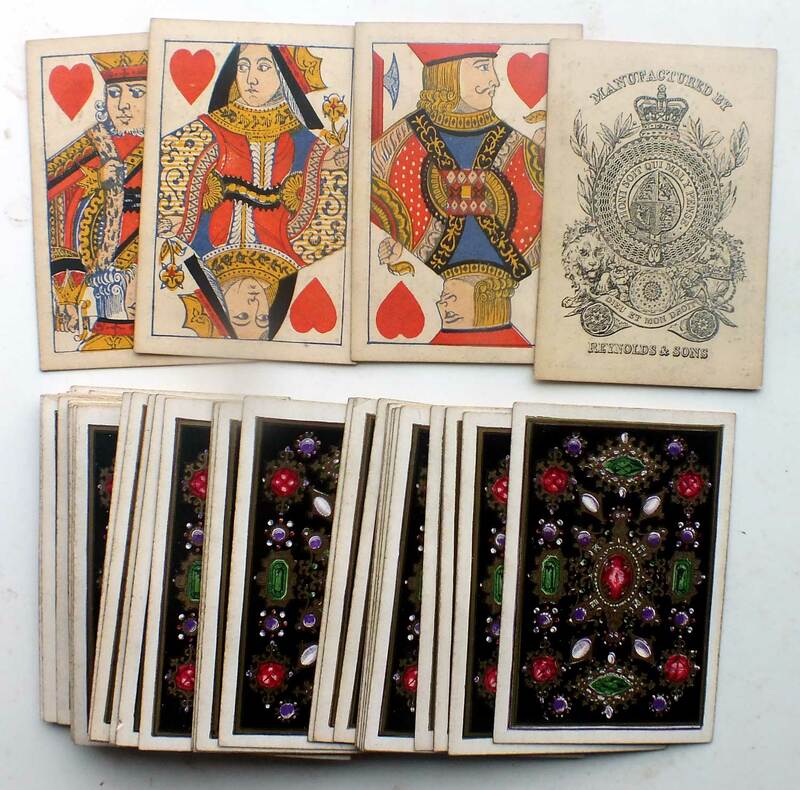 Reynolds & Sons produced a variety of non-standard or variant designs, as well as Transformation packs with designs by T.S. Chapman and Crowquill, and fortune-telling cards. In around 1885 the firm appears to have been acquired by Charles Goodall & Son. 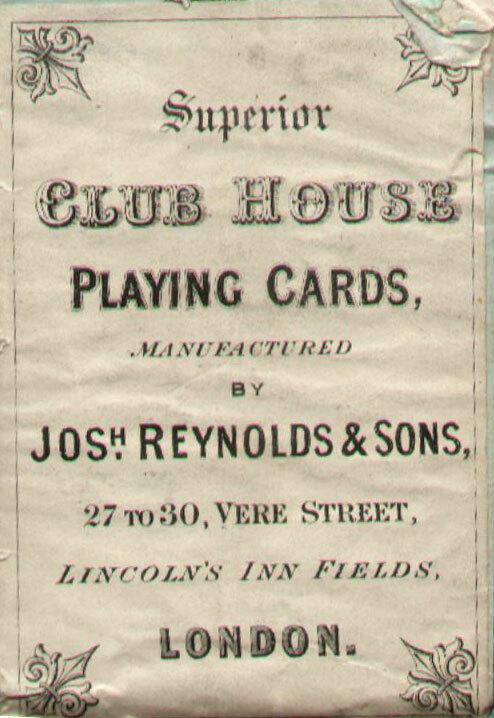 Left & below: cut out wrapper fronts advertising "THE GREAT MOGUL" (c.1830) and "Superior Club House" playing cards (c.1870s) by Reynolds and Sons, 29 & 30 Vere Street, Lincoln's Inn Fields, London. Images courtesy John Sings.